Out of the three Scruff Stuff Beard Balms that I have used, Scruff Stuff ‘Black Pepper and Bergamot’ Beard Balm has been my favourite. The ‘Chocolate Mint‘ was very good and the ‘Chocolate Orange‘ was nice but the ‘Black Pepper and Bergamot’ has that perfectly balanced scent like the Scruff Stuff Oils. The sweet citrus notes of the Bergamot are complimented by the warmth and spicy Black Pepper, its one of those scents that you have to just keep having a quick smell of! I have said many times before that James the guy behind the Scruff Stuff brand is one of the best, if not the best at blending the essential oils to give the scents. Never over done, the scents don’t out compete each other, they are always perfectly balanced. Scruff Stuff ‘Black Pepper and Bergamot’ Beard Balm is a blend of Shea Butter, beeswax, Jojoba oil and Grapeseed oil to which the essential oils are blending to create the scent. The balm has a nice firm consistency and quickly warms in your hands, once warmed it easily works into your beard and down onto the skin underneath. My beard was left looking tamed and in place and the balm gave it a nice hold. 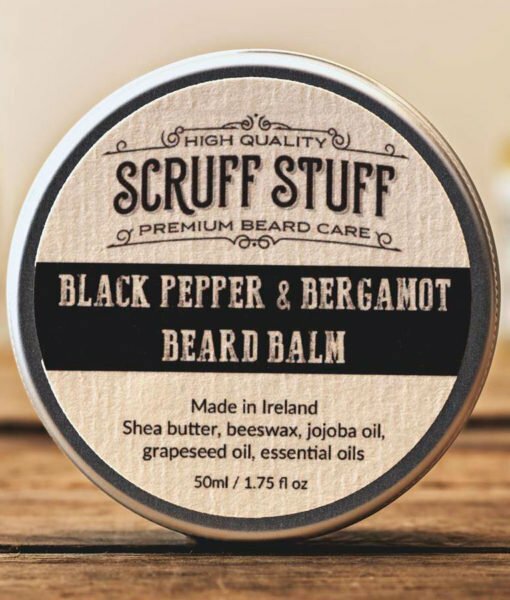 Housed in a 50ml / 1.75 fl oz screw top tin, Scruff Stuff ‘Black Pepper and Bergamot’ Beard Balm is available from the Scruff Stuff website for £12.95 and you should seriously consider buying this balm!